GfZ and I headed to the range today with targets in hand for the monthly ePostal match that Brigid and Partner are running. Just as I was getting happy with the zero another group of shooters showed up at the next booth... and that's when things went downhill in a hurry. Junior was carrying his own rifle and not watching the muzzle, but he got it in the rack pretty promptly. Dad wasn't really paying attention to much of anything. Grandma had a clearly-diagnosed cased of the, "I-don't-wanna-be-heres" and was snapping at all of 'em. This wasn't shaping up well at all. Then the bored girlfriend behind the booth on the other side started playing games on her phone - with the sound up high enough to be heard through her plugs/muffs. Back on the other side, Grandpa was now browbeating Grandma that she needed to shoot, why else did she come? Junior stepped up for his turn, and muzzled Grandpa and then Dad getting his rifle out of the rack and on to the bench... and I decided it was past time to go. We gathered up our stuff, pulled our target stand at the next cease-fire, and skedaddled. Best guess, we shot maybe 100 rounds of .22 between us. On the way home, we stopped at BassPro and I picked up a set of scope rings, a laser boresight, and huzzah two more boxes of .22 at normal prices. Was hoping to get some range in this weekend. Yesterday it poured cats and dogs consistently enough that range would have been unpleasant at best. Today? Hot. Well, I can deal with that. Unfortunately, the NOAA SPC has dumped us on the edge of a "Moderate" risk category with some rather ugly probabilities inside. The range opens at noon. If I'm there waiting, maybe I can get an hour in before the afternoon storms boil up. I just turned down the trigger weight on the new rifle (I am an unabashed lover of Accutriggers). It is now at a weight best described as ,"If I think hard it's going bang." I've got most of the rest of the pieces en route from various sources (Brownells is running a 7.5% off code - "FRK", and Midway is running a set of coupons* as well). I need to get scope rings, but want everything else in hand before deciding on those. BassPro is just down the highway for that acquisition. No, I haven't told what it is, but there have been a few clues posted. When it's all put-together, then I'll post a couple pictures. Preferably with the first couple targets. * - Midway's codes are: 14JUN15 for $15 off $100, 14JUN30 for $30/200, and 14JUN45 for $45/300. Usual restrictions on clearance and sale items apply. I've got a .308 rifle on the way to me, and in an odd alignment of fate, got email from SGAmmo.com with some clearance deals... including on Remington Premier Match 168gr SMKs... for $180/case of 200, or $19/box of 20. The only places I've seen that ammo still listed it's (A) out of stock and/or (B) $31/box ... or more. If you shoot .308, this is a SMOKING deal. A couple weeks back I asked for input on choosing a stove for backpacking. I hadn't really considered canister stoves because of the need for a non-refillable fuel supply, but when I got to digging some more I decided that at least for now, a canister stove made sense. Light, compact, reliable... the downside to canister stoves comes below 30 degrees, where the fuel gas can't evaporate fast enough to keep it lit. I still intend to pick up an MSR Whisperlite liquid-fuel stove for such times, but that's not today's problem. Unfold the stove so it locks in place, then thread it onto the gas bottle. Side note: the "stored" position for the valve handle is NOT FULLY CLOSED. Make sure you close it the half-turn or so before threading on the gas bottle. I then popped it on the stove and started a timer... and waited for a rolling boil. Yeah. 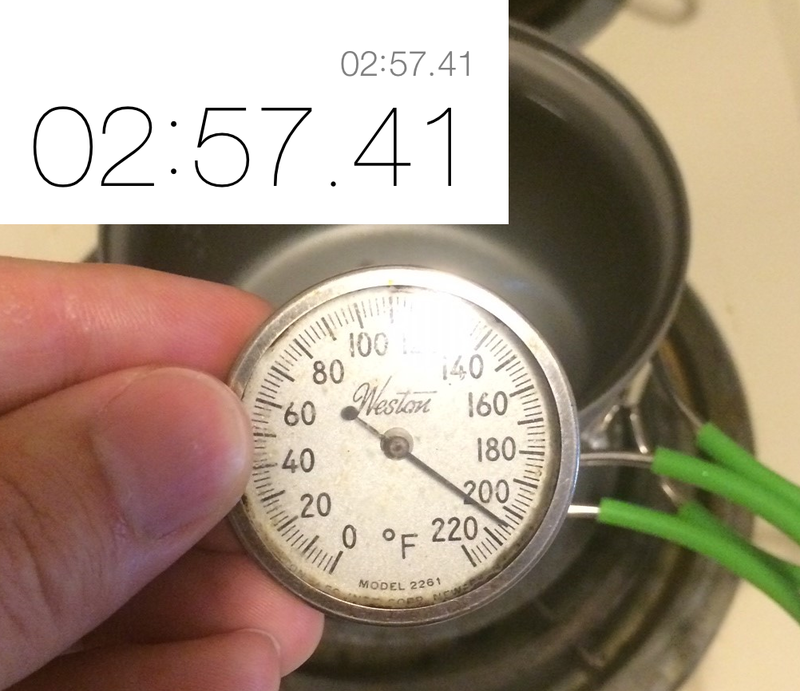 Under three minutes from "tap cold" to "rolling boil". Here's the good: It's easy to set up, easy to light, and heats water FAST. Downside: Like most canister stoves, it feels "tippy". It has a very high center of mass, so you've got to make sure it's on a level surface. The fold-out pot supports work great but feel like they're going to get stiff as the pivot heats and cools repeatedly. The valve is touchy. It's very easy to try for a slight adjustment and turn it off instead. Fuel cans are $5 at BassPro, the stove was $45ish, and the pot set another $30. It all fits together beautifully and is lightweight. Since most of my pack food is going to be of the "add hot water" variety, this is a good option. If you're a camp gourmet and need to simmer, be prepared to swear a few times as you try to adjust the heat level. I'm pleased with the purchase and look forward to using it in the woods soon. Body armor is traditionally pretty expensive stuff. There are various levels, from "I" to "IV" with a handful of steps between. IIIA is the most resistant soft armor out there, and should prevent penetration by handgun rounds up to .44Mag and 9mm from a sub-machine gun. Medium-coverage off-the-rack vests start around $550 and go up from there, to well past a thousand dollars for full coverage fitted armor. For most people, that falls into "prohibitively expensive" for an item that is unlikely to see much use. US Palm has created a product to fill a niche market, and I suspect they have pretty well nailed it. The Defender is a front-and-back plate carrier designed to cover the vital organs and arteries at an affordable price point. They make a few different models, retailed online through SGC-USA and other places (Midway carries and Primary Arms used to carry their products). I got a "MOLLE" version in size large. If you don't care to attach anything, this is nearly as low-profile as the "slick". If you do want to attach things, this gives the greatest flexibility. The plate is dated, and warrantied for five years. Note the disclaimer on the label, "This panel is not NIJ certified due to dimensions." In other words, it's too small to be certified for duty use. What to clip on those MOLLE straps? Up to you. I haven't found what I want just yet, but it's likely to be a flashlight pouch, universal holster, and 3 magazine pouches. (For size comparison, that's a S&W M&P40c.) The pads above the armor are the removable pads for the shoulder straps. They ride well but are bulky. If you're going to wear this under a light jacket or sweatshirt, it's probably worth removing them and padding the straps with something a bit more discreet. So: what is it really for? It's a "bump in the night" set. With your preferred "stuff" on it, it's a way to grab ONE thing and go figure out whether someone is kicking the front door or the cat knocked over a lamp - instead of fumbling for your glasses, then flashlight, and pistol, and where the hell is the spare mag for this thing? If a rifle is your house gun, I'd still go for the MOLLE vest - and then spend extra to get the mag pouches you want and arrange them as you like. If you travel through less-pleasant neighborhoods and have a get-home kit, this might be a good piece to add. If you're going to Kabul (or Oakland), this is not enough. Fortunately, you can purchase SAPI plates from various sources and slide them into this carrier. I said I wasn't going to torture-test this. I'm still not going to. US Palm did it for us with a nice five-minute video here. Short form: stopped all handgun rounds tested (from .22LR through .44Mag 240gr), stopped a load of #4 buckshot, failed to stop a 12ga slug. No surprise on that last bit. Bottom line: if you've toyed with getting some kind of armor but keep choking on a $500+ price tag, this may be a good compromise. I'm happy with my purchase. That should be plenty to keep me busy for a few days, I think. Stay tuned. Powder for the "standard" rifle calibers has been nearly impossible to find lately. I happened across a thread on one of the forums that Grafs had IMR 4895 in stock. I checked, and they showed "less than 5 available". I've got *mumble* 5.56 rifles already, and a .308 on the way. 4895 is a classic, reliable powder for both of those. I gritted my teeth and grabbed the plastic. Eight pounds of 4895 is on the way. It's enough for several hundred rounds of both 5.56 and .308... figuring 45gr for .308 and 23gr for 5.56, I should be able to load about 800 rounds of each. I've checked the usual suspects for other components, and it looks like things are pretty readily available. Prices are up from what I remember, but not horribly. After that ... a few boxes of factory ammo at different weights to see if the rifle has a favorite, then pick up dies and start stacking components in. I finally got a can of Iso-Pro fuel for my new stove and had a chance to run it. First impression: Not bad at all. I filled the pot about 2/3 full (650mL or so according to the writing on the side of the pot) and set it on the stove on high-ish. Time to boil, uncovered, was under 3 minutes. The flame seems ... touchy. The longer the stove runs the lower the flame gets - which isn't terribly surprising given the adiabatic properties involved - but it IS noticeable. People have mentioned in other reviews that this isn't a "simmer" stove, and I believe it. That said ... most of my cooking is going to be "make water hot, add to dry food", so simmer isn't needed. The stove tucks in to the bottom of the fuel can. The fuel can slides in the pot set. The pot set has a snug-fitting stuff sack. The whole thing is about as big as a one-pound coffee can and weighs roughly as much. Very slick. Photos at a later date. I remembered to check the power mirrors and A/C and radio. I forgot to check all the power windows, the wipers, and a few of the lights. I always chat a seller. Sure, people can lie. Some do it well. But I usually trust my BS detector. After nine years of BS by phone, it's pretty well tuned. This guy wasn't selling BS. It drove well. Real well. The mileage was a touch higher than I'd have liked but not bad. There were a few dings and scuffs - but it's a ten year old car. As we were driving back to the Walmart we'd met at, I said, "Alright, you've got it listed for $4600. I want the car. How much do you really need for it?" He hemmed and hawed and hesitated. I glanced at him as he chewed on his lip. "Will you take $4300 for it?" The relief was damn near written on his face. I suspect he might have gone a couple hundred lower, but honestly, I thought it was a fair price - and he did too, as he thought for about three seconds and said, "Sounds good." I hadn't brought enough cash with me to buy the car (not even close), so I said, "Can I give you a deposit now, and we can connect in the next day or two to finish it up? I've got $200 with me." He agreed. We wrote out a simple receipt, I noted the VIN and license plate, and we nailed down a time to meet the next day. The next day I withdrew the balance I needed from the bank, called the DMV to double-check paperwork needed, and added the car to our insurance. We met the seller at his bank, signed and notarized the paperwork, and drove off our separate directions. Tuesday morning MrsZ took care of the safety inspection and registration, and it's done. Ours. It needs a bit of maintenance stuff - new brake pads and probably an alignment - but overall I think we did fine. The car, you say? It couldn't be more boring: A 2004 Toyota Camry LE, white with a tan interior, and 178,000 miles. Good gas mileage, reliable, safe. Total grandparent car. Kelly's books it at $4,600 in 'good' condition and Edmund's at $3,000. I think Kelly's is much closer, looking at the listings out there. MrsZ is taking it on a longer-ish road trip soon and will report back. I won't lie. I've had more than a few "poor me" moments in the last month. Moving halfway across the country and finding out eleven months later that your job is going away can lead to such things. Some days are bad, some days are good. And then something comes along and makes me say, "Self, it could always be a LOT worse." Erik and Sabra (neither of whom I particularly know, but have had passing conversations on the book of face via Kelly) are being tested. In a big way. She's pregnant with a child who won't survive. Their landlord is giving them the boot. The car has crapped out. We got there early and I did a check-in on Facebook. I was so, so excited and happy about this. And she quit talking. And then she excused herself and brought in another tech to repeat the scan. That might be the last picture I get of my baby. Of course I want it. There is a fundraiser started. The goal is entirely manageable. The gun community is one of the most generous I have ever been involved with. If you don't mind making your coffee at home for a week, can you toss a sawbuck their way? Blogger and friend Peter has published his fifth book in the last year, "War to the Knife". I've thoroughly enjoyed the first three books of the Maxwell saga, and bogged down a bit in the non-fiction piece about prisons... but I expect to enjoy "War" as much as I did the Maxwell books. I'll be downloading it to the Kindle this evening.